On Monday, the Edmonton Oilers unveiled former Hockey Canada head Bob Nicholson as the new CEO of the Oilers Entertainment Group. Nicholson left no room for doubt as to his authority, telling assembled media that everyone in the organization now reports to him. Less clear was precisely what he plans to do with his new authority. Nicholson’s opening press conference, and a subsequent interview with 630 CHED’s Bob Stauffer – who, Nicholson explained, also now reports to him – were long on enthusiasm for the new downtown arena and the outcome of the weekend’s NHL Draft Lottery. They were short on his plans for the organization. As of today, everyone in the organization reports to myself. The timelines, I’d like to do it right away but I’m certainly not going to state that. We’re going to do it when the time is right; there are a lot of playoff games going on and we’re going to look at the hockey [side]. The nice thing about vague answers is that it leaves Nicholson with lots of room to operate. We can read practically anything into his comments. Does the organization plan to fire Kevin Lowe and Craig MacTavish and start fresh with new people from teams currently in the postseason? That’s certainly possible. Does the team plan to leave everybody currently in place in their respective positions? That’s certainly possible, too. Nicholson made a point of emphasizing loyalty, trust and teamwork. Does that mean the Oilers’ organization will continue to employ people like Lowe, who have long ties to the club? That’s possible. Does it mean that Nicholson needs to bring in people he can trust to do the top jobs in the organization? That’s possible too; as he told Bob Stauffer the first step in a successful organization is “to get the right people in the executive level and move forward.” He didn’t offer an opinion on whether the Oilers currently employed the right people. There was a lot of hokey stuff in the opening press conference about lucky socks, lucky loonies and lucky Bill Scott, but there wasn’t much substantive on Nicholson’s plans for the group and it’s hard to think that wasn’t by design. We know he’s a well-regarded professional, we know that he isn’t beholden to anyone in the current hockey operations group and we know that he’s spent the last few months forming an opinion of the way the organization operates. We’re still waiting to see exactly what that opinion is. It is perhaps telling that Nicholson didn’t mention how he was looking forward to working with Lowe and MacTavish, but then again perhaps it isn’t. McDavid moved the timeline up. It can’t be a coincidence that this happens 2 days after the bombshell. Katz was no longer willing to wait. Kudos to the Flames – they have had a great season and are an exciting team. But the Oilers are going whole hog. Stanley or bust baby. Unfortunately for you guys, it’s been pretty much a solid decade of going whole hog on down the ‘bust’ road. Ugh. Those are the Flames your talking about, buddy. The only kudos they get are for firing the GM that was building them into a contender. As a alberta fan who flows both the oilers and flames it is a great year so far. I live in Nigeria so have limited coverage but do get enough information. As for the oilers i believe this was the plan as of three years ago. Once Katz knew he was getting an arena they started with this plan to build the latest dynasty. Yes they had to have some luck for sure but no one can tell me that guy like Lowe and Mact are this bad. They have been operating inside the plan set for them to create a dynasty. Which of us when given the chance would not take the same risk if a dynasty lead by Mcd was the plan. I am not defending the OBC but hey seems like it is all coming together now eh. Not it appears all is coming together Nicholsen will be the start and depending on the feelers he sets out in the league more changes will if the gets the feeling the people actually think Lowe and Mact are this bad. You can’t cheer for the Flames and the Oilers. It insults both teams. 3. Lowe is moved out of hockey ops to special advisor. Sometime before Free agency a hard push at Babcock, Mclellan and Julian. I would aim hard a Babcock. With the management sorted, and the roster with Mcdavid, they approach free agency and land a stud D if available… Martin, Green, Sekera. They will also land a vet goalie such as Anderson, Ward for a pittance. With a new defence and a vet to be 1A1B with scrivens goaltending increases to 9.05-9.10 next year vs 8.89 this year. I doubt Mac T risks a non proven goalie this year. If this all plays out the way we are hoping it will, then this will be the second time in the Katz era that an outsider has been brought in to do a seemingly redundant job and then a year later be told to clean house. Nicholson’s mission statement must be: DO NOT SCREW THIS UP! With that in mind…MacT is a well meaning GM, but Chiarelli is an experienced and cup-winning executive. Do not screw this up-Hire him. Todd Nelson is a good man and a good coach, but Babcock or Mcllelan are experienced and successful NHL coaches. Do not screw this up-Hire one of them, but keep Nelson as associate. Target strength and experience in UFA pool (Justin Williams, Paul Martin, Niemi) and via trade (Seabrook and Lucic). Buyout Nikitin. Use Schultz, Marinicin, Lander (or Gordon) and picks as trade chips. The Oilers have reportedly already reached out to McLellan. They need to do this to sell to team MCDAVID. His Dad is no fool.. will want a culture of winning… not losing. MacT and Kevin Lowe need to be kicked to the curb as fast as possible. The longer that takes, the longer we will be out of the playoffs. 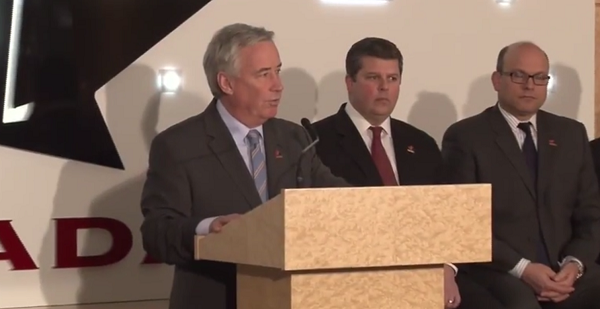 Interesting photo, both GM standing with Bob Nicholson are both fired this year. Nonis and Chiarelli are fired.